WHITMAN, Mass. 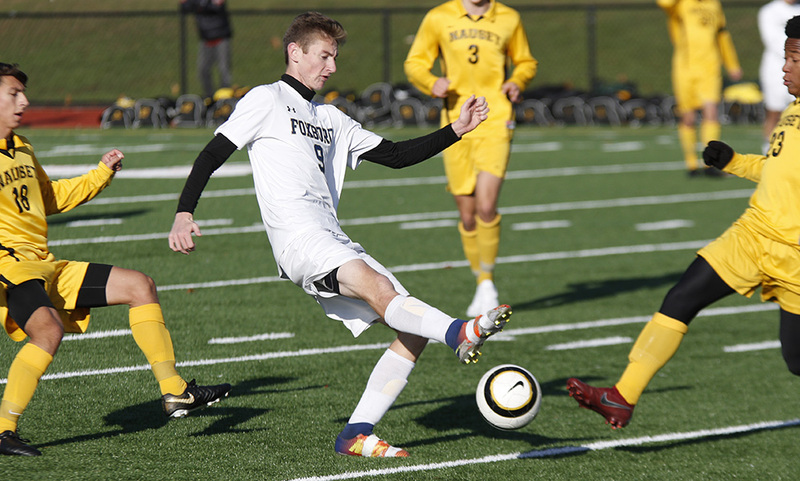 – For the first 40 minutes, Foxboro boys soccer kept pace with top-seeded and undefeated Nauset. The Warriors had the advantage in corner kicks, an even number of chances created, just one less shot than Nauset, and trailed just 1-0 at the break. But in the second half, Nauset showed why its considered one of the top teams in the state, scoring three straight goals en route to a 4-1 win in the D2 South Semifinals. “I just think we were second to every ball,” said Foxboro head coach Joe Franchino. “Our passing was off today, we weren’t playing to feet. Our Achilles heel has been giving up goals but [Nauset] is a good side. While Nauset got a shot on goal in the first minute, Foxboro created an opportunity just 60 seconds later. Will Regan delivered a free kick from midfield but the ball took a strong bounce and was just out of the reach of Dylan Barreira at the post in the 2nd minute. After applying some pressure, Nauset broke through in the 13th minute. A failed clearance fell to the foot of senior Avery Santoro and he buried his low shot from a step inside the area inside the far post. Despite going behind a goal, Foxboro still had its chances to pull level. In the 18th minute, junior Joe Cusack lofted a free kick in behind the defense where senior Matt Garcia connected with a driving header but his bid was just over the bar. Senior Nic Beigel had a pair of shots in a ten minute span, both forcing saves. In the 21st minute, Beigel delivered a low shot from 25 yards out and in the 30th minute, the senior got off a hard shot but both were at the keeper. Foxboro had two more chances in the final 10 minutes of the half. Arguably the best chance came off the foot of Garcia, who delivered a tempting ball through the area to the back post but no one made a run and the ball was touched out by the keeper. On the second ensuing corner kick, Barreira’s service was cleared to Cusack, who played the ball back into the area. Tim Behn had a look from just outside the six yard box but his shot was blocked and cleared away. Once the second half began, it was all Nauset. The top-seed showed their offensive prowess and needed just over six minutes to add to the lead. Ethan Boyle played a ball over the top of the defense and Romell Brown hit a volley off the bounce that went over the hands of Foxboro freshman keeper Derek Axon and under the bar for a 2-0 advantage. In the 55th minute, Nauset center back and All-American selection Abdel Talabi played a ball into the area, sophomore Ben LaBranche flicked it on, and senior Curtis Moore was open for a header across the line. Two minutes later, Anthony Lavoti worked his way past a defender and fired a close range shot that Axon got a piece of but the rebound bounced over the line for a 4-0 lead. Nauset scored all three of its second half goals in a 10-minute span. “They finished,” Franchino said of the difference in halves. “They were getting a bunch of chances, just weren’t finishing. They play very direct, lump it into the box, and get bodies onto it. They close very hard too. Foxboro got on the board in the 75th minute. Beigel dispossessed a Nauset defender and went on a break down the right side. Beigel waited until Talabi committed before sliding a pass over to Barreira and the junior tucked his right-footed shot inside the near post to make it 4-1. Foxboro boys soccer finishes the season at 9-7-5 with a league-high 57 goals, which is the most scored in the Hock since the Warriors scored 70 in 2015. #3 Milford, 0 vs. #11 Walpole, 1 – Final – Click here for a Recap and Photo Gallery from this game. #13 Foxboro, 4 @ #12 Dartmouth, 3 – Final – Foxboro junior Dylan Barreira scored a hat trick and the Warriors held off a late surge from Dartmouth to secure the win. Matt Garcia gave the Warriors a 1-0 lead in the fifth minute, hitting in a corner from Joe Cusack. Barreira then scored goals in the 38th minute, the 64th minute (PK), and the 67th minute. #13 Foxboro advances to the D2 South Semifinal to play #1 Nauset (20-0) on Saturday at Whitman-Hanson at 1:00. #2 Franklin, 3 @ #3 Hopkinton, 2 – Final – Franklin overcame an 0-2 deficit, rallying to win 3-2 (19-25, 23-25, 25-16, 25-21, and 15-11). The Panthers took a 6-2 lead in the final set before Hopkinton surged ahead 8-7. But Franklin didn’t crumble and won six straight points and never looked back. Ellie Wisniewski led Franklin with 20 kills, Hailey Sanders added 14 kills, and Maggie Doyle had 11 kills and nine blocks. #2 Franklin advances to the D1 Central West Final and will play the winner of #1 Acton-Boxboro (18-0) and #4 Shrewsbury (19-3) on Saturday at Wellesley High with a time still to be determined. #1 Canton, 3 @ #5 Medway, 1 – Final – Click here for a Recap and Photo Gallery from this game. #6 Oliver Ames, 1 vs. #11 Walpole, 2 – Final – Click here for a recap and photo gallery of this game. #13 Foxboro, 2 @ #4 Quincy, 1 – Final – Foxboro scored a pair of goals in the first five minutes of the second half to earn an upset on the road at Quincy. After a scoreless first half, Shane VandenBoom opened the scoring by heading in a cross from Matt Garcia just a minute into the second half. In the 45th minute, VandenBoom got his second goal by heading in a corner from Joe Cusack. Quincy scored in the 74th minute. Foxboro advances to the D2 South Quarterfinal and will visit #12 Dartmouth (10-8-1) on Tuesday at 6:00. #3 Foxboro, 1 vs. #14 Medfield, 0 – Final – Click here for a Recap and Photo Gallery from this game. #1 Foxboro, 2 vs. #8 Cohasset, 2 – Final (Cohasset wins 4-3 in shootout) – Click here for a Recap and Photo Gallery from this game. #2 Franklin, 3 vs. #7 Concord-Carlisle, 2 – Final – Franklin survived an upset bid from Concord-Carlisle, escaping with 3-2 win to advance (25-10, 25-15, 21-25, 24-26, 15-13). Lauren McGrath set a program-record with 55 assists to put the offense in motion while Ellie Wisniewski (11 digs, three aces) had a strong game at the net with 21 kills. Allyson Bonnet-Eymard (eight digs) added 15 kills, Hailey Sanders finished with 11 kills, Maggie Doyle (four blocks) chipped in with eight kills, and Riley Marino anchored the defense with 21 digs. Franklin advances to the D1 Central-West Semifinal and will play the winner of #3 Hopkinton and #11 Shephard Hill on a date and time to be determined. 1st Quarter: (NA) Russell Dunlap fumble recovery in the end zone, Tyler DeMattio XP good; (NA) Brendan McHugh 2-yard rush, T. DeMattio XP good. 2nd Quarter: (NA) B. McHugh 3-yard rush, T. DeMattio XP good; (S) Jeremy Ruskin 26-yard pass to Chris Gong, Mitchell Director XP good; (NA) Nick Raneri 17-yard pass to Ryan Gaumond, T. DeMattio XP good; (NA) N. Raneri 24-yard pass to R. Gaumond, T. DeMattio XP good. 3rd Quarter: (NA) Brett Labonte 4-yard rush, T. DeMattio XP good. 4th Quarter: (S) J. Ruskin 4-yard pass to C. Gong, M. Director XP good. Canton, 2 @ Foxboro, 2 – Final – Twice Canton took a one-goal lead and twice Foxboro responded in a quick manner to earn a draw at home. Paul Corcoran converted a sliding shot in the 2nd minute to give the visitors an early advantage but Nic Beigel brought Foxboro level, converting a penalty drawn by Matt Garcia. In the second half, Simon Cruz made a nice near post run in the 59th minute and hit a one timer to make it 2-1 in favor of Canton. But just four minutes later, Beigel grabbed his second with a nicely placed shot from outside the area. Canton, 2 @ Foxboro, 2 – Final – Foxboro built a 2-0 lead but Canton scored twice in the final 20 minutes to earn a draw. Sophomore Katelyn Mollica put the hosts up 1-0 in the 10th minute, an advantage Foxboro took into halftime. Ten minutes into the second half, Kaitryn Franchino scored her second goal in as many games to make it 2-0. But Canton scored on a penalty kick in the 62nd minute and tied the game in the 71st minute to earn a point on the road. Canton, 0 @ Walpole, 4 – Final – Canton sophomore Riley O’Connor made 16 saves in goal, but the Bulldogs fell on the road to the Porkers. North Attleboro, 0 @ Taunton, 4 – Final – Taunton scored a pair of goals in each half to pick up a win over visiting North Attleboro. Alana Tavares scored both goals in the first half to give the Tigers the lead. Seniors Lauren Torres and Cierra Bartel each scored once in the second half for Taunton while Emma Sheehan made five saves in goal. THS head coach Liz Hathaway said Jillian Pagliuca, Jocelyn Pagliuca, and Kathryn Robinson all played well for the Tigers. Oliver Ames, 2 vs. West Bridgewater, 1 – Final – Oliver Ames scored once in each half to pick up a win over West Bridgewater. The Tigers had 13 corners and peppered the West Bridgewater net with 21 shots. Meaghan Rockey scored OA’s first goal on an assist from Maggie Woods. Rockey then set Maura Kiernan up for the game-winning goal at the midway point of the second half. Ocean State Invitational – Mansfield’s Patrick Heavey earned a third place finish to help the Hornets take a third overall as a team. Heavey clocked in at 16:33.8 for third while Paxton Howard (17:30.9, 38th), Mike Mullahy (17:31.5, 40th), and Cullen Lancaster (17:32.3, 42nd) all had top 50 finishes for the Hornets. Oliver Ames was fifth as a team led by Zane Reservitz’s (16:51.1) 10th place finish and Rory McLaughlin’s (16:54.9) 12th place finish. North Attleboro senior Liam Monahan was 11th overall, crossing the finish line at 16:54.7. In the other varsity race, Foxboro’s Ryan Proulx finished in 17:33.1, taking 22nd overall. Ocean State Invitational – Foxboro had two runners finish in the top 10 of the Division 1 Varsity race, helping the Warriors earn a fourth place finish. Junior Abby Hassman was fourth overall at 19:28.4 while senior Lexi Quinn took seventh at 19:34.5. Lindsey Nelson was the third Warrior to cross, taking 17th overall in 20:41.4. In the Division 2 Varsity race, Mansfield girls were 20th overall. Senior Margaret Riley (20:50.3) and sophomore Tessa Lancaster (20:51.7) took 43rd and 44th respectively. North Attleboro was 22nd overall with junior Olivia Forbes having the top time, taking 80th in 21:41.1. Attleboro junior Shea Jamieson had the top finish of any Hockomock runner, clocking in at 20:41.1 for 37th. The Bulldogs have been one of the top offensive teams over the past two seasons, and that trend will likely continue with the personnel returning this season. The goal this season is to equal that success on the defensive end of the field. 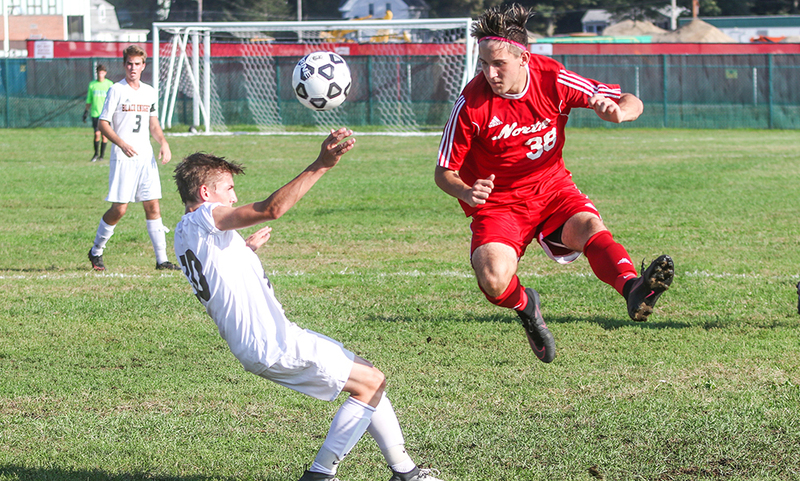 “We have had lots of success the past two seasons in scoring goals but we have not been stingy enough with allowing goals,” said Canton head coach Danny Erickson. Hockomock League leading scorer Paul Corcoran is back for his senior season and has been one of the top producers in the final third over the past two seasons. His nine goals in 2016 helped earn him HockomockSports.com Underclassman of the Year honors and last year he led the Hock with 15 goals and 23 total points. He is joined by HockomockSports.com Best XI selection Griffin Roach in the midfield. Roach is one of the best two-way players in the league and will undoubtedly be relied upon to help both the offense (10 goals, five assists last year) and the defense. Simon Cruz is another player with a good amount of varsity experience that will likely factor in. While the offense looks to be in good shape, shoring up the defense won’t be easy after losing starting goalie Abe Garber and center back John Agnitti. However, Erickson can rely on Paolo Ruggeri to lead the way in the back. Ruggeri has a ton of varsity experience and will be the quarterback of the defense, organizing and keeping the back four in shape. Junior Alejandro Correal will step in as the starting keeper. Foxboro head coach Joe Franchino isn’t afraid to talk about how confident he is in this year’s team. “The Hockomock title is coming to Foxboro,” Franchino said. Although Foxboro graduated a dozen seniors, the players that the Warriors do return are the reason why Franchino is so confident in this group. Starting up top, Foxboro has both of its strikers back, including leading scorer Shane VandenBoom. Last year, VandenBoom was second in the league in the regular season with 21 points, scoring 12 goals and adding nine assists. He will be joined up top by Dylan Barreira, who had a strong sophomore season. In the midfield, everything will run through junior Joe Cusack. There aren’t many midfielders that have the poise on the ball that Cusack does and he will likely be the engine for the team. He isn’t the biggest player on the pitch but his vision is among the best and his ability to play balls over the top and through the defense make Foxboro’s offense very dangerous. Nic Beigel will complement Cusack in the middle to give the Warriors a solid 1-2 combo. Defensively, the Warriors are hoping to see more of the same after only allowing 15 goals through 18 regular season games. The good news is that Foxboro has plenty of experience returning in the back with Matt Garcia, Brian Gardner, and Will Regan back in the fold. Franchino stressed that the team must put defense first and buy into the system, and then the team can go forward — an area the Warriors are very confident in. After missing out on the postseason by just one game, the 2018 Scarlet Hawks are laser-focused on making it into the state tournament and having a run at the division title. Third-year head coach Brian Edwards saw his team go from four wins to seven over the first two years and is hoping that upward trend will continue in 2018. One big reason for optimism is junior Walisson De Oliveira, who exploded as one of the best offensive threats in the league in the second half of the season. After playing in the midfield for half the year, Edwards moved De Oliveira up top and the move paid off big time. The striker scored 14 goals (second most in the Hock) and had three assists. In the midfield, the Hawks boast a trio of talented and experienced players. Tiago Carvalho, Joao Boaventura, and Jordan Borges have all shown improvement over the offseason and will be counted on to handle the middle of the pitch. Seniors Joey Madden and Zach Brown return to anchor the defensive unit in front of senior goalie Cam Doherty. Despite graduating over a dozen seniors from last year’s Davenport division-winning squad, North Attleboro head coach Geoff Burgess believes his team will be ready to defend its league title. The Rocketeers will have to find a replacement for HockomockSports.com Best XI selections Gabe Pinhancos (center mid) and Brendan Matracia (goalie), as well as the entire back line, but Burgess does have options to fill the voids. Senior striker Joe Hilf was second on the team in points last year after scoring six goals and adding two assists and Big Red also has junior midfielders Dylan Corrigan (four goals, three assists) and James Sale back in the fold. All three have plenty of varsity experience and should be major factors for North this season. Junior Joey Coscarella will see more playing time as well this season. Senior captain Evan Rosenberg will step in at center back to anchor the new back four. Burgess is also optimistic about his options in net with junior Kyle Briere taking over as the starter. Only one year removed from winning the Davenport title, Sharon is hoping its versatility will help get them back to the top of what is shaping up to be a very competitive division. The Eagles have a strong core of returning players that Kelly can build off of. Ethan Kantor is back for his third year in goal and will be the leader of the defense. Alex Dias returns from a torn ACL to take up one of the outside back positions. Kelly expects Brendan Arnold and Daniel Gunduz to step up on defense this season. In the midfield, junior Michael Baur (HockomockSports.com Second XI selection) will be a key piece and help the Eagles transition from defense to offense. Baur is also one of the more dangerous free kick takers in the league. Baur will work with the speedy Isaiah Stessman and Norway-transfer Viktor Schneider on the wings in the midfield. Kelly is looking for junior Brian Higgins and Daniel Lillenfeld to form a dynamic partnership up top while Antonio Elkoury and Eli Berkowitz can step in and provide depth in both the midfield and up front. After three straight years in the playoffs, the Black Knights had a down season a year ago but new head coach Joshua Aubin is anxious to get Stoughton back into playoff contention. Stoughton will be relying on its 10 seniors to set the pace this season, starting with captain Fabi Ponce de Leon. In his fourth year on varsity, Ponce de Leon will be the engine in the middle of the field and help facilitate things for the Black Knights. Aubin is looking for some new faces to step up around Ponce de Leon to take some pressure off the senior and give him some space. Fellow captain John Ortiz will be a leader for a defensive group that is looking to improve on last season. All-Hockomock selection Carter Gerome returns as the starting goalie for the Black Knights. CANTON, Mass. 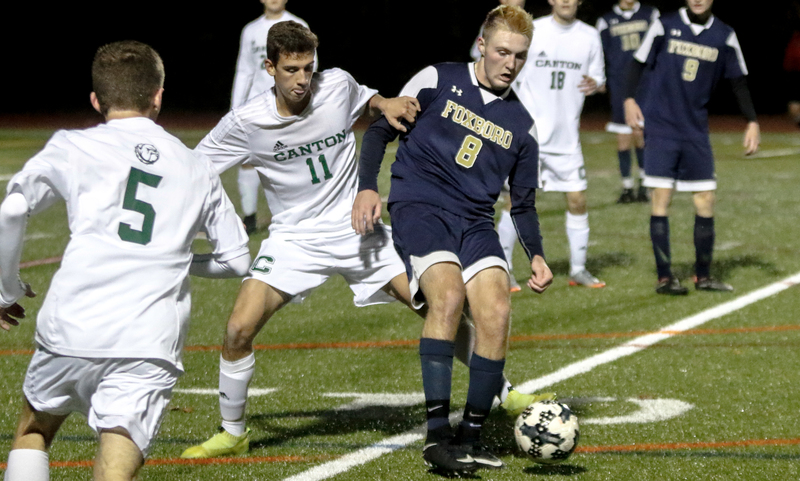 – After both regular season meetings against Canton, the Foxboro boys soccer team felt like they had let a point get away. The first time, the Warriors saw the Bulldogs erase a pair of one-goal deficits to earn a draw. The second meeting saw the Warriors come back from a goal down, but couldn’t add a second despite nearly a dozen scoring chances. This time around, ninth-seeded Foxboro made sure history didn’t repeat itself. After eighth-seeded Canton cut the deficit to just one goal in the second half, the Warriors went on and finished the game strong with two more goals and registered a 4-1 over the Bulldogs. Foxboro came out with its foot on the gas with two big chances inside the opening 10 minutes. Shane VandenBoom left a ball behind to Ryan Kelley in the third minute, but Kelley’s blast was over the bar. Four minutes later, senior Hussein Kafel found VandenBoom in behind the defense, but Canton center back John Agnitti did well to recover, slide and get just enough of a block on the shot to make it a comfortable save for Bulldog keeper Abe Garber. But after play evened out some, the Warriors capitalized on a free kick opportunity. In the 24th minute, sophomore Dylan Barreira whipped a service to the back pose and Kelley rose up above his mark and nodded in the opener. Neither side hag a legitimate scoring chance in the first half until the final seconds when Canton’s Paolo Ruggeri sent in a left footed shot from distance but Foxboro goalie Bobby Harrison covered nicely. While the first half was limited to just a handful of chances, the second half opened up with opportunity after opportunity. The Bulldogs nearly leveled the match just two minutes into the second half when the Hockomock League’s regular season leading scorer Paul Corcorantracked down a loose ball and had his shot partially blocked, forcing Harrison to make a save while backtracking. A minute later, VandenBoom had his back towards goal inside the area, releasing a shot while turning but Garber made the stop. Foxboro broke through again in the 46th minute. Junior Matt Garcia played a ball wide for Kelley, and the senior drove a low cross the near post. VandenBoom made the run and got just enough of a touch to tap it in for a 2-0 lead. The Warriors’ two-goal cushion didn’t last long. Three minutes later, the Bulldogs earned a free kick from just over 40 yards out on the left sideline. Junior Griffin Roach stepped up and ripped a curling shot into the upper corner at the near post, eluding Harrison’s diving effort, to bring Canton back within one. But unlike the previous meetings, Foxboro made sure to put this game away. Kafel came close to adding Foxboro’s third with a near post bid two minutes later, but Garber made the low save. Five minutes later, Kelley dribbled his way past two defenders and had a golden chance but Garber came sliding out for the huge stop. Harrison was called upon to make a stop in the 50th minute, saving Corcoran’s hard shot from 30 yards out towards the post. Foxboro added the big insurance goal midway through the second half when sophomore Joe Cusack helped turn defense into offense, quickly linking up with Kelley, who took little time depositing a through ball behind the defense that VandenBoom ran onto and calmly finished alone on goal. Canton continued its pressure, earning a free kick from 25 yards out that senior Jake Verille placed around the wall, but Harrison made a terrific diving save to get a hand to it and push it out for a corner. Foxboro put the finishing touches on the match in the 78th minute when Cam Cass took possession along the right side, put in a centering pass that VandenBoom dummied to draw the defender, leaving Kafel open to finish alone on goal. Foxboro boys soccer (11-4-4) advances to the D2 South quarterfinals to take on #1 Nauset (17-1-1) on Thursday, November 9th at 6:00. Canton finishes the season 10-5-4. FOXBORO, Mass. 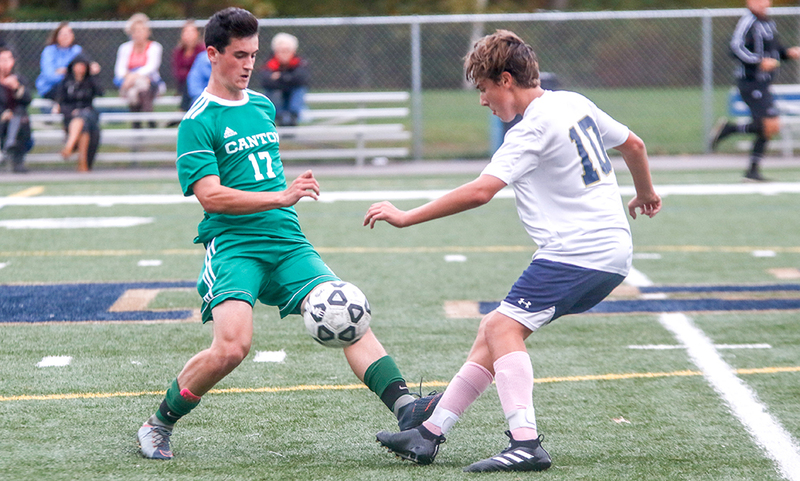 – With the wind at its back, Foxboro boys soccer had nearly a dozen legitimate scoring chances in the second half alone, but walked away from Sam Berns Community Field with a 1-1 draw against visiting Canton. The strong wind helped dictate the play in both halves. Canton benefitted in the first half, while Foxboro took advantage in the second half. Canton came out strong despite being on the road. It took less than two minutes for the Bulldogs to register a scoring chance as Simon Cruz set Griffin Roach up for a chance just inside the area, but Roach’s shot went wide at the far post. Four minutes later, the Bulldogs created another chance and this time, chased in. A deflected clearance fell right back into the area and Canton junior Paulo Ruggeri did well to use his body to shield some space, taking the ball down and placing it in from close range to make it 1-0. Bulldogs senior keeper Abe Garber made one of his several stellar saves in the eighth minute, denying Foxboro sophomore Dylan Barreira at the near post after being sent in behind the defense by Shane VandenBoom. Canton nearly doubled the lead in the 17th minute when junior Paul Corcoran found Cruz atop the area, but Foxboro goalie Bobby Harrison – who was well off his line — got just a touch to the shot and the ball was cleared away. Foxboro found the equalizer in the 18th minute. After a throw from Matt Garcia found its way over the top of Canton’s defense, Foxboro senior Ryan Kelley barreled his way through traffic, eventually getting the last touch off the front of his head and in from close range to tie it 1-1. “To give up a goal within the first 10 minutes and then to get it back in the first half is a lot of credit to the guys,” Franchino said. “They kept fighting and didn’t give in, even against the wind. With the wind making it difficult for Canton to clear its own zone, Foxboro put the pressure on to try and score the go-ahead goal. In the 38th minute, Hussein Kafel served a cross from the left side that VandenBoom ran onto at the near post, but his touch was over the bar. Kelley nearly found a second tally when he got his head to Barreira’s corner in the 39th minute, but the senior couldn’t get all of it. Just two minutes later, Garber robbed Kelley of his second goal. Kelley dribbled past a pair of Canton defenders and ripped a shot at the near post, but Garber did well to get down and make the stop. Nic Beigel had his chance just four minutes later when he weaved his way through the defense and had a go, but once again Garber was in great position to knock the shot away at the near post. In the 69th minute, VandenBoom hooked up with Barreira once again, but the sophomore’s shot at the near post was just inches over the bar. VandenBoom had a chance himself a minute later when he tracked down a ball over the top, but he couldn’t get over his volley and his shot was just high. Foxboro finally had Garber beat in the 77th minute when an errant header found Barreira, who placed his shot at the far post outside the reach of Garber. However, Canton defender Mike Mazzola was in the right spot and got a touch on it, with Garber smothering the rebound. The Warriors had a final chance in the 78th minute when Garcia placed a perfect service into the area that VandenBoom got his head to, but Garber grabbed his final save to preserve the point. “On the day, I didn’t think it was much of a contest in the second half,” admitted Canton head coach Danny Erickson. “They played very well, kudos to Foxboro. I thought they were the better side, we were unable to find any part of our game…we couldn’t connect passes, we weren’t winning challenges. Both sides came into Tuesday’s contest with a mathematical chance at the Davenport, but North Attleboro clinched the division with a win at Milford. Foxboro boys soccer (10-4-3 overall, 8-4-3 Hockomock) will host the Rocketeers on Thursday night to close the regular season. Canton (8-4-4, 7-4-4) will entertain Stoughton on Friday before heading to Marshfield on Monday to conclude the regular season. Oliver Ames, 0 @ Attleboro, 1 – Final – Attleboro junior Will Halben scored the lone goal of the game in the 10th minute and senior goalie Nick Hasenfus had a strong performance in goal to help the Bombardiers score an upset of top-ranked OA. Canton, 2 @ Sharon, 1 – Final – Canton junior Paul Corcoran broke the deadlock with 15 minutes to play, netting the game-winner to help the Bulldogs earn two points on the road. Canton junior Avery Minkin scored his first career goal to give the Bulldogs a 1-0 lead entering halftime. Sharon senior Christian Villanueva scored the equalizer early in the second half before Corcoran netted the winner. Foxboro, 4 @ Milford, 1 – Final – Foxboro scored three goals in the second half to secure two points on the road at Milford. Hussein Kafel opened the scoring in the 10th minute, finishing a rebound off a shot from Ryan Kelley. Kafel doubled Foxboro’s lead in the second half but Milford cut the deficit in half with a penalty kick. Matt Garcia and Dylan Barreira scored in the final 20 minutes to ice the game. Shane VandenBoom had two assists in the win for Foxboro. Franklin, 0 @ Mansfield, 1 – Final – Mansfield senior John Cooney netted the lone tally of the game and senior keeper Nick Ferraz made a pair of highlight saves in the first half to help the Hornets preserve the lead, and the win, against the visiting Panthers. Cullin Anastasia set up Cooney for the only goal. Taunton, 1 @ King Philip, 2 – Final – King Philip erased a one-goal first half deficit, scoring once before the halftime break to knot the score, and then again early in the second half for the winner. THS took the lead in the 17th minute but KP scored in the 31st minute with Mike Rowe nodding in a corner kick from Camron Lawrence. The Warriors scored the winner in the 44th minute when Cam Koch latched onto a loose ball in the area, burying it backside to make it 2-1. Stoughton, 1 @ North Attleboro, 4 – Final – North Attleboro scored a pair of first half goals, and then survived an early second half strike from the visitors to stay in first place. Joe Hilf (14th minute) and Gabe Pinhancos (33rd minute) each converted breakaway chances to put the hosts up 2-0. Stoughton’s Jayden Falise buried a rebound on a chance from Ritchy Laguerre to make it 2-1. Pinhancos then buried a chance from the top of the box in the 60th minute, and James Sales capped the scoring with his first career goal in the 68th minute on an assist from Ryan Pasquel. Attleboro, 1 @ Oliver Ames, 0 – Final – Isabella Salviati scored the game’s lone goal on what Attleboro coach Steve Santos described as a “great hustle play.” OA coach Britt Sellmayer said that Emily Nosalek and Sofia Masciarelli played well in defeat. Canton, 4 @ Sharon, 2 – Final – Riley Duserick scored a pair of goals to lead the Bulldogs to the victory that clinches Canton a return to the state tournament. Morgan McCabe and Elisa Diletizia also scored for the Bulldogs and Leianna Brune recorded an assist. Ally Filipkowski scored both goals for the Eagles in the loss. Bridget McManus and Keegan Veazey recorded assists for Sharon. Milford, 0 @ Foxboro, 4 – Final Lily Sykes scored two goals, including a 40-yard strike, and had an assist for the Warriors. The second goal was the 50th of her career. Shaina Abbott and Jordyn Collins had the other two goals for the Warriors. Milford coach Jay Mastaj said that Juliana France, Rachel LeBlanc and Brianna Braza had good games for the Hawks. Mansfield, 5 @ Franklin, 1 – Final The Hornets broke open a 1-1 tie with four second half goals and stayed tied atop the Kelley-Rex division standings. Taylor Smith had a brace and an assist for Mansfield, while Cassidy McMahon, Stephanie Kemp, and Amanda Mangano each had goals and Emily Vigeant had a pair of assists for the Hornets. King Philip, 5 @ Taunton, 1 – Final – Avery Snead scored two goals and Chloe Layne, Abby Baker, and Emma Durant each had one for the Warriors. Emily O’Gara scored the lone goal for the Tigers. Click here for a Photo Gallery from this game. North Attleboro, 3 @ Stoughton, 0 – Final – North Attleboro deposited all three of its goals in the first half to beat Stoughton and clinch the 2017 Hockomock League Davenport division title. Mackenzie Rosenberg had a pair of assists in a five-minute span, setting up Emma Gaulin for the opener and then Asyln Gaulin to make it 2-0. In the 28th minute, Haley Guertin made it 3-0 on a feed from Leah Jette. Nina Beauvais recorded the shutout in net for the Rocketeers. Canton, 1 vs. Notre Dame Academy, 3 – Final – Canton split the first two games, but NDA rolled to two straight wins to grab the victory 15-25, 25-19, 9-25, 21-25. Hannah Jerrier had 13 kills and two blocks and Nicole Brown had 27 assists for the Bulldogs. Hockomock League Championships (@ Blue Hill Country Club) – Click here for complete results from the event. Click here for a photo gallery of the event.